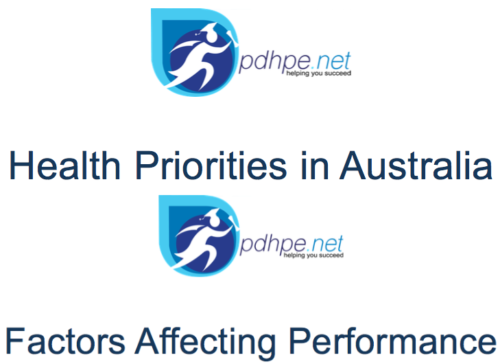 How are Priority Issues for Australia’s Health Identified? What are the priority issues for improving Australia’s health? What role do health care facilities and services play in achieving better health for all Australians? What actions are needed to address Australia’s health priorities? How does training affect performance? How can nutrition and recovery strategies affect performance? How does the acquisition of skill affect performance? How are sports injuries classified and managed? How does sports medicine address the demands of specific athletes? What role do preventative actions play in enhancing the wellbeing of the athlete? How is injury rehabilitation managed? How do athletes train for improved performance? What are the planning considerations for improving performance? What Ethical Issues are Related to Improving Performance? When people think of physical preparation for sport, they normally think of a warm-up. However, this dot point covers more than this. It looks at whether the body is physically prepared for particular sports competitions and levels. This includes the pre-screening of would be athletes to ensure they do not have any health or medical conditions that need to be catered for in a training program. Physical preparation also refers to the athlete’s skill execution and technique. Can the athlete complete the skill correctly and repeatedly? Poor technique leads to injury and needs to be corrected in order for the athlete to be prepared for training or competition. It is also important to examine the physical fitness levels required for the competition and training schedule. Athletes should have the right fitness levels (both health-related and skill-related components should be considered) for their particular sport and performance level. This is not to say that physical preparation does not include the warm-up, stretching and cool down, it is just not limited to it. Check out the pdhpe.net App. It can be found in the App store or in Google Play. Click the image for more information.